Who are Comhar Naíonraí na Gaeltachta? Comhar Naíonraí na Gaeltachta (CNNG) was established in 2004 by Údarás na Gaeltachta (the State Authority for the Irish-speaking regions of Ireland) to provide early childhood education services through Irish in the Gaeltacht area’s. 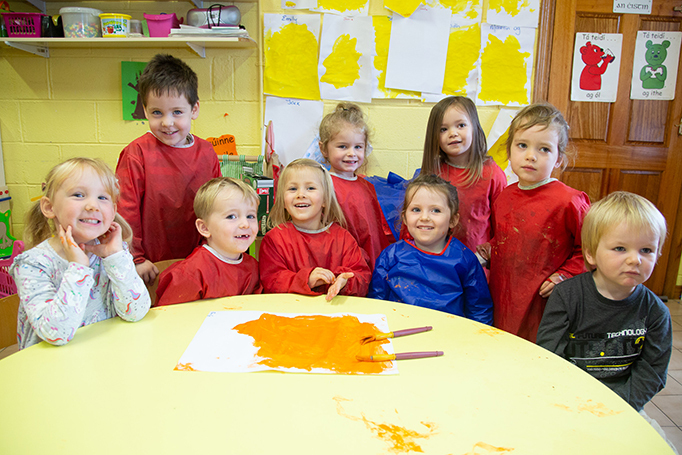 CNNG provide administration, support and training services for early childhood education and care services which includes naíonraí, crèches, breakfast clubs, afterschool services and parent and toddler groups in the Gaeltacht areas. To provide high quality early childhood care and education services through Irish in the Gaeltacht areas. To ensure that the child and the child's needs and development are centric in all our policies. To promote and develop the natural use of Irish among the children attending the services. To have ongoing co-operation with the Tusla to ensure that the Childcare Regulations (Preschool Services) (No. 2) 2006 are being implemented in all our services and that those services are compliant to national regulations. To co-operate with the Department of Children and Youth Affairs in administering the ECCE, CCS and TEC schemes for the services for which we are responsible. To ensure that the national frameworks Síolta and Aistear are being implemented in our services and to provide relevant training on this to our employees. To co-operate with all the relevant national and statutory bodies to ensure the delivery of the best service to the children in our services. Recruitment and employment of staff for the various services. We ensure that all our employees have the relevant childcare qualifications and that the CNNG Recruitment policy is strictly implemented. Development Officers are employed in all the regions in which we operate to provide support and advice to the services. We have a Development Officer who is an Accredited Trainer for the Keeping Safe Child Protection Training Programme available to provide training for the employees of CNNG regarding all aspects of child protection. We develop support materials for the services such as the ‘Loinnir’ preschool activity programme, the ‘Borradh’ language planning series, Policies and Procedures Manuals and a Forms Manual. We organise regular support meetings with all staff to ensure that they have all the support and resources they need to provide a high quality service. We liaise with Tusla to ensure that our services are fully compliant with the Childcare Regulations (Preschool Services) (No. 2) 2006. We organise Parent Meetings for parents whose children will be attending our services. We do the administration work for the various State funding which our services receive. We provide a competitive Insurance Group Scheme for our services. We provide a Toy Library in the Gaeltacht Regions where services can borrow educational equipment and toys for their service. We publish a twice yearly newsletter ‘Bláthú’. Comhar Naíonraí na Gaeltachta are overseen by a Steering Committee with representatives from all the Gaeltacht areas. The main office is located in Cuileán, An Cheathrú Rua and we have Development Officers operational in the other Gaeltacht regions. CNNG provide the overall administrative structure for the services. All services have local support committees which provide on-going support to the services at local community level.